William Pearse Lillicrap is recorded as being baptised on July 30 1820 as the son of Richard Lillicrap, a farmer, and his wife Mary in the Parish of Lesnewth Cornwall. In 1847 William Pearse Lillicrapp married Grace White (March Quarter 1847 St Geo Hanover Sq Vol 1 Page 26) in London. In the 1841 census, a Grace White aged 20 (not born in county) appears with a large collection of other young women in the household of Isabella Hicks, a dressmaker, in Mount St, St George Hanover Sq registration district. Mount St intersect with Davies St. Her sister Mary White married Samuel Walter (see The Family of Daniel Walter of Babcary, Somerset in the June Quarter of 1846 (St Geo Hanover Sq Vol 1 Page 35). The business appears to have struggled in the 1850s as William Pearce Lillicrapp, furrier of Davies Street, Middlesex appears in a list of bankrupts. 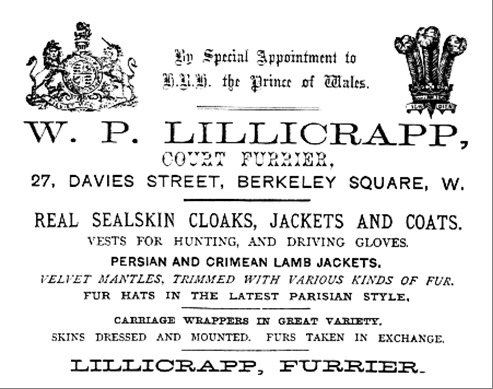 However, by 1861, he is advertising himself as a dealer in all kinds of foreign and English skins - sealskin cloak and general fur manufacturer, 19a Davies-street, Berkeley Square. Plus a general assistant, cook and two porters - which suggests 2 men rather than 1 man. "The leading furriers exhibit; but with few exceptions they have limited the furs exhibited to the rarest and most costly descriptions. The seal-skins shown by Mr Lillicrapp (4505) have never been equaled for beauty and fineness. They are the produce of the small seal, whose habitat is in the waters around Cape Horn and the Falklands." 4505 Lillicrapp W received an honourable mention "for good manufactured seal dresses." In 1863, he is reported as having been "appointed furrier to his Royal Highness the Prince of Wales. The appointment, we believe, has been given in consequence of the position Mr. Lillicrapp obtained in the International Exhibition, by the select quality of the furs shown in his cases, which produced very influential patronage and commendation." In March Quarter 1865, however, LILLICRAPP William Pearce (Marylebone 1a 463) was registered dead. RICH FURS. From 15 guineas to 290 guineas. SEAL SKIN CLOAKS choice in shape, and rich in quality. From £7 10s. to 35 guineas. A large Stock of CARRIAGE WRAPPERS. From 2 guineas to 40 guineas. GENTLEMEN'S FUR COATS of various kinds. From 5 to 25. GENTLEMEN'S SEAL SKIN VESTS. 25*. FUR GLOVES. From 15s. to 35s. FURS OF EVERY DESCRIPTION CLEANED, ALTERED, AND EXCHANGED. 19A DAVIES STREET, BERKELEY SQUARE. N.B. In accordance with the new Regulation of the Board of Works the number is now 27 DAVIES STREET. (Daily News, Wednesday, August 28, 1867) - MIDDLESEX SESSIONS. Archibald Logan, 40, a man of gentlemanly appearance, described as an engineer, was indicted for stealing two cloaks, value £55 13s, the property of Grace Lillicrap. Mr. Sleigh and Mr. Montague Williams (instructed by Messrs. Dod and Longstaffe) prosecuted; Mr. George S. Griffiths (instructed by Mr. F. W. Parkes) defended. It appeared that the prisoner obtained the articles in question by false pretences from Mrs Lillicrap, a dealer in furs, living at 27 Davies-street, Berkeley-square, the prisoner representing himself as a Captain Logan, who had just returned from India, and stating that he wanted the furs for his wife, and giving as his reference certain persons of rank who were customers of the prosecutrix. From the evidence it appeared that the prisoner went into the prosecutrix's shop, and said that he was Captain Logan, and had just returned from India. In affected style he inquired of the foreman (Mr. Clarke) if they had such articles as sealskin cloaks, to which he replied they had, and the price varied from £7 to £86, according to the quality. He said he was rather pressed for time, and wanted to purchase one for his wife, who was at Old Windsor, to which place he intended to go by an express train. He said that as ladies had very peculiar ideas as to such articles, he was very desirous that two cloaks should be sent to his wife for her to select one. He did not want to go to the extent of £36, but wanted one at a medium price. On a question being put to him as to his residence, he said he lived at No. 29, Grosvenor-street, and that he would return one of the cloaks, or if neither fitted he would have one made. He mentioned that Lady Marian Springfield, Major Ward Jackson, and Captain Wright were friends of his, and as they were also customers of Mrs. Lillicrap he was entrusted with the goods. He ordered them to be made up in as small a parcel as possible, and took them away with him. The goods were only entrusted to him on the understanding that one was to be immediately paid for, and the other to be returned the next day, but he never appeared. It was mentioned that a Mr. Moss Benjamin was called as a witness at the police-court, who stated that on the very day after the prisoner obtained the cloaks from Mrs. Lillicrap he went to him and sold the cloaks, for which he received a sum of £45, but after the first examination this witness never again appeared, and all efforst to find him had been unavailing. When Benjamin did appear at the police-court he produced a bill of his purchase of the cloaks which had been altered from 18 guineas to 28 guineas, and it was said that the prisoner had actually obtained £5more than the invoice made out at Mrs. Lillicrap's. Mr. Edward Lillicrap was examined, and said he called upon the prisoner at No. 28 (sic), Grosvenor-street, and said he had come about the mantles, as he was not stisfied about his references. The prisoner said the mantles were at a friend's, and that he could not have them. Witness asked him for the address of his friend, when he prevaricated, and said he lived in the country, and made other statements to lull his suspicions. Some day or two after the prisoner drove up to Mrs. Lillicrap's, and accused him (Mr. Lillicrap) of stealing a mare belonging to him. Mr. Lillicrap, with a desire to get back the cloaks, said he would tell the prisoner all he knew about the mare, which was in reality nothing at all. In cross-examination, this witness said the landlady where the prisoner lodged had stated that the prisoner only went into her house upon the day he obtained the mantles. When apprehended in Hyde-park by Dawson 121A, he said to a friend, "Go down to Benjamin's and get them (the mantles) or it will be hot for me this time. I shall get ten years for it." Superintendent Hannant proved that the prisoner had not been in India for the last three or four years. The jury found the prisoner "Guilty," and a previous conviction for three years' penal servitude, from which he was only liberated on the 4th of July of this year, was proved against him. The judge sentenced him to be kept in penal servitude for ten years. "On the 6th inst at Hanover Church, Regent Street ROBERT DURANT, third son of ALFRED SAMUEL HULL of Norwich to LOUISA JANE, second daughter of SAMUEL WALTER late of Babcary, Somersetshire. The 1905 Post Office Directory continued to list the business at 27 Davies Street but in the 1908 directory no. 27 is occupied by an antique furniture dealer. Robert D. Holl's death at the age of 56 is recorded in 1910 (Whitechapel 1c 173). All of the addresses occupied by the Lillicrapps and Holls were redeveloped at various times in the 20th century. A further redevelopment of 15-25 Davies Street was a winner of the Housing Design Awards 2005. It replaced a 1960's construction regarded as 'misguided'. The recent mixed residential/commercial building is distinctly modern in concept.